The SUNY College of Environmental Science and Forestry (ESF) has earned a place among the top universities in America for 2015, as ranked by U.S. News & World Report. ESF is ranked number 30 among the nation's top public universities in U.S. News' 2015 edition of Best Colleges, the smallest institution to receive such a distinction. When both public and private universities are included, ESF is listed as number 76 on the Best National Universities list. ESF was also recognized as one of the best college values in the nation, earning a ranking of 45 on the U.S. News "Great Schools, Great Prices" list. ESF is the only SUNY campus listed among 50 schools selected for this recognition. ESF is also on the U.S. News list of colleges whose students graduate with the least amount of student loan debt. ESF is the only SUNY institution on the Top 30 Public National Universities list and the top-ranked SUNY school on the Best National Universities list. Both rankings are the highest ESF has ever received. ESF, with only 1,700 undergraduates and 500 graduate students, is by far the smallest school among the top public national universities. "We are pleased that ESF has earned this national ranking in recognition of its outstanding programs and value," said college President Quentin Wheeler. "It reflects ESF's position among the finest universities in the United States and affirms that we offer a high-quality education that is a great value for our students. The credit for our success must go to our faculty and students, whose dedication to excellence and the environment are making our world a better place." The magazine says the National Universities category comprises the institutions (173 public, 100 private and seven for-profit) that offer a wide range of undergraduate majors as well as master's and doctoral degrees. Many of the nation's most prestigious research universities are ranked in this group. The calculation to determine the best-value schools takes into account a school's academic quality, based on its U.S. News Best Colleges ranking, and the 2013-14 net cost of attendance for a student who received the average level of need-based financial aid. The higher the quality of the program and the lower the cost, the better the deal. 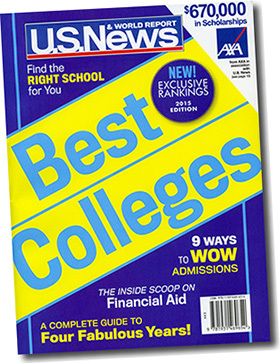 Only schools in or near the top half of their U.S. News ranking categories are included because U.S. News considers the most significant values to be among colleges that perform well academically. U.S. News pointed out that 64 percent of ESF students receive need-based grants. Improvements in ESF's rankings by university officials across the country, through the process of peer assessment, and strong student retention and graduation rates were significant factors in ESF's higher overall rankings. "Again this year, we are proud to see so many of our SUNY campuses recognized as being among the best nationally by U.S. News and World Report," said SUNY Chancellor Nancy L. Zimpher. "In every community across New York State, SUNY colleges and universities like ESF offer students top-quality degree programs and applied learning opportunities that prepare them for success in today's 21st-century global economy. Congratulations to each of the SUNY campuses making the list for 2015."